What % of Americans say there is hardly any difference in what the Democratic and Republican parties stand for. Describe how much of a difference you think there is in what the Democratic and Republican parties stand for. Use one fact about current American political parties to support your claim. What trend do you see in the data? Explain whether this trend is good or bad news. How do you think that trend will impact the American political system? What issue do you think the Democrats and Republicans parties most agree on? 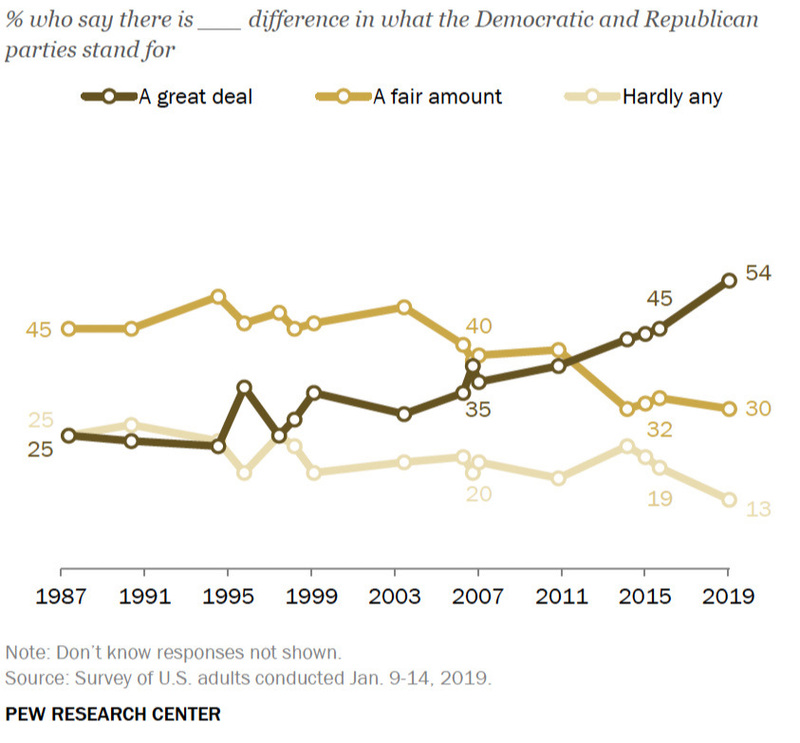 The majority of Americans now say that there is a great deal of difference in what the Democratic and Republican parties stand for. What issue do you think the Democrats and Republicans parties most disagree about? The United States has a two-party system. Describe what it is about our electoral system and the way we vote that leads to the two-party system. In what way do you think the two-party system is good for the political system of the United States? 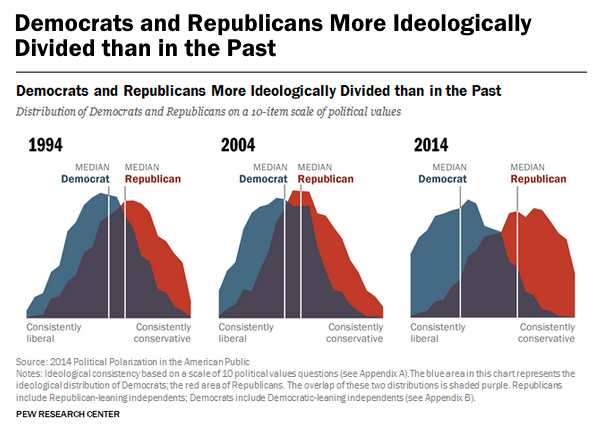 Another name for this divergence in what the parties stand for is political polarization. What impact do you think the news media has on poltical polarization? Imagine you became king of American for a day. What would be one remedy to make American less polarized? In the current system of political party polarization, explain whether you think that the two major parties would come together to do what is best for our nation in a time of crisis. In Federalist No. 10 (one of our required foundational documents), James Freaking Madison wrote about factions (what today we might call political parties) saying, "a number of citizens, whether amounting to a minority or majority of the whole, who are united and actuated by some common impulse of passion, or of interest, adverse to the rights of other citizens, or to the permanent and aggregate interests of the community". What the HECK does this quote mean? What would you say is the common impulse or passion which unites Democrats? What would you say is the common impulse or passion which unites Republicans? Watch this fantabulous video about Duverger’s Law and the origins of our two-party system. Ask five people to describe how much of a difference you think there is in what the Democratic and Republican parties stand for. Share your analysis of your results in class or online. You can listen to an interview with the band plus the two new Vampire Weekend tracks!